If you are looking for a coffee table to match existing in your living room, office, or a sitting area in a bedroom, our Amish Santa Barbara Coffee Table is ready to answer your call. 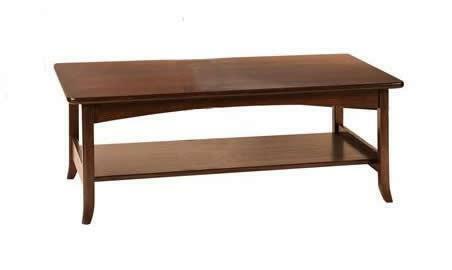 This mission-style, solid wood coffee table with an open design will pair well with a variety of furniture styles thanks to its minimalistic design; and custom options like your choice of wood type and finish, and the ability to order stain samples before final purchase makes it easy to match the furniture you already own. This rectangular coffee table includes a 1-inch thick top, open shelf at the base, arching apron, and splayed legs with outside roundovers.